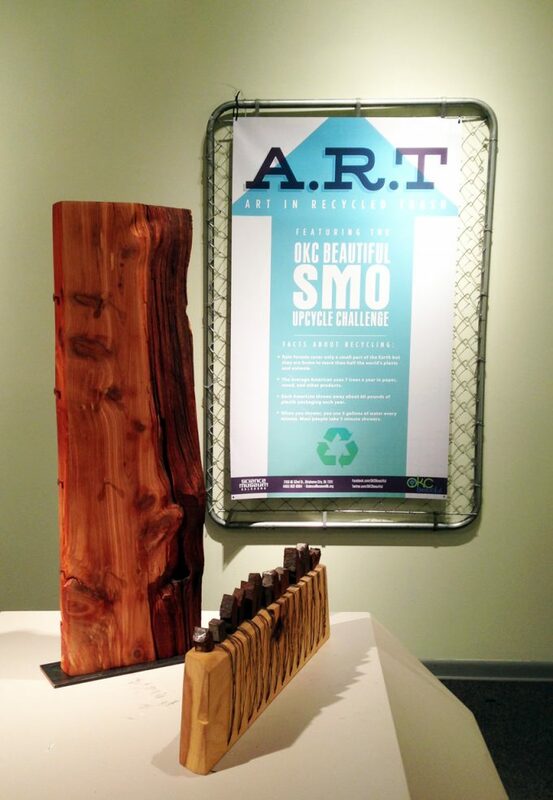 On Nov. 14th, 2013 OKC Beautiful will present the “Art In Recycled Trash” show opening in the Satellite Gallery of Science Museum Oklahoma. Share Furniture will be presenting a table made from a recycled industrial electrical box along with two Kyle Golding original sculptures, both make from items others would throw away. This event is being held in celebration of America Recycles Day. America Recycles Day (ARD) is the only nationally recognized day dedicated to promoting recycling programs in the United States. Science Museum Oklahoma and OKC Beautiful come together to host an invitational and juried exhibit of recycled art. Both two and three-dimensional work will be on display. Twenty artists have be selected from entries submitted for the exhibition, selected by Satellite Galleries Director Scott Henderson to express exceptional creativity and ingenuity in the reworking of materials and items that would be considered waste. Recycled art can be defined as an art form that uses old or used items or day to day trash to create something which is brand-new, and attractive. Recycled art can also be referred to as an environment friendly art form, as the waste products are re-used, which helps in keeping our environment clean. All work will be for sale during the exhibit Nov 14- Feb 14th.